Can you sing 22 musicals in just 12 minutes? 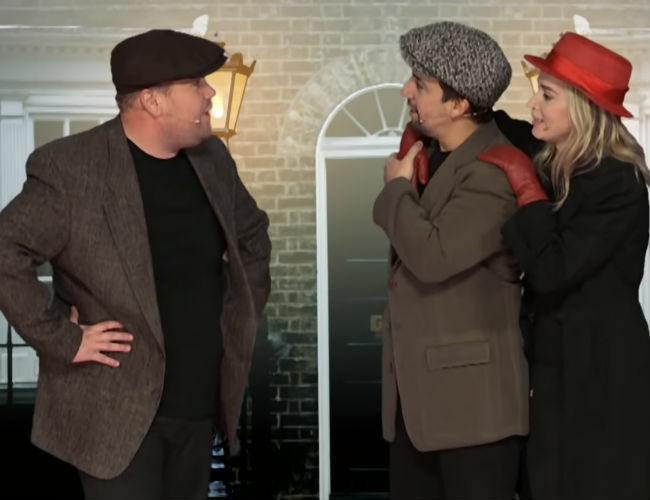 Emily Blunt, Lin-Manuel Miranda and James Corden can! James Corden, host of, as luck would have naming-wise, The Late Late Show with James Corden, love musicals. And Emily Blunt and Lin-Manuel Miranda are currently starring in a musical at the moment by the name of Mary Poppins Returns (which is a supreme delight, and yes you must see it now). So naturally it makes perfect that one of the stops on the world-spanning advertising campaign for the film should be on the show where Corden, who’s not adverse to some singing and acting himself, danced and sang up a storm with Blunt and Miranda as they amusingly, and impressively, dash through songs from 22 musicals in 12 gloriously-frenetic minutes. As Nerdist observes, if you’re a fan of musicals, and these actors/singers/all round wonderful people, there’s a lot to enjoy in this video. “Our favorite has to be either Lin-Manuel stepping into Gene Kelly’s shoes for the iconic title track from Singin’ in the Rain, or him popping up again as the Toto to Emily Blunt’s Dorothy in “Somewhere Over the Rainbow” from The Wizard of Oz.